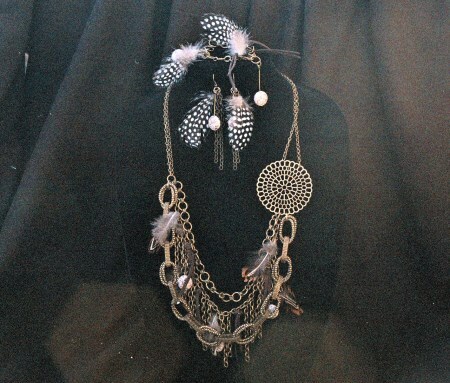 Brass chain,bead and feather necklace, bracelet, earring set. Chain this brass rose over your heart with five different brass chains. Two fine chains suspend the brass rose, which ,in turn, suspends three bolder chains; at 26 inches is a simple one to three to one link chain, next is an oval link chain suspending feathers, leather strips, beads and chain dangles, and finally, a bold beaded and mesh link chain. 26 inch and longer necklace, 7 inch bracelet and french wire earrings.